I wouldn't really consider myself a picky eater. But I've never really been a fan of leftovers. Even my favorite dishes lose all appeal once they enter the cold depths of my refrigerator. The thing is, now that I am a new mom, I need to take advantage of leftovers. Getting dinner on the table every night can be quite a challenge (especially when my little girl decides that she's not in the mood for an afternoon nap! ), so I'm learning to repurpose. By creating a "new" dish out of leftovers in the fridge, I can trick myself into eating (and even enjoying!) something that would have otherwise met its demise a long time ago. I'm guessing this will work for kids who aren't too keen on leftovers, too! One of my favorite ways to disguise leftovers is to turn them into an enchilada casserole. 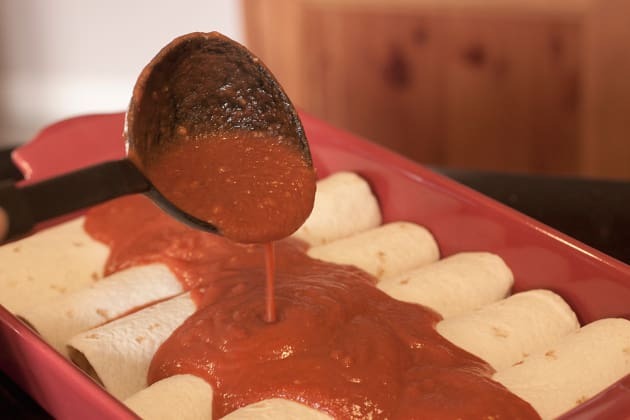 I just make a big batch of my favorite enchilada sauce ahead of time (it keeps well in the fridge for a few days, or it can even be frozen) and then the casserole comes together in a matter of minutes. 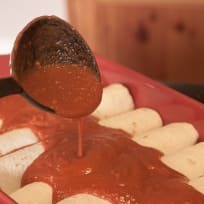 Simply spread a small amount of sauce in the bottom of a casserole dish. Then, roll leftover shredded beef, chicken, pork, or even roasted vegetables in tortillas with a bit of cheese. 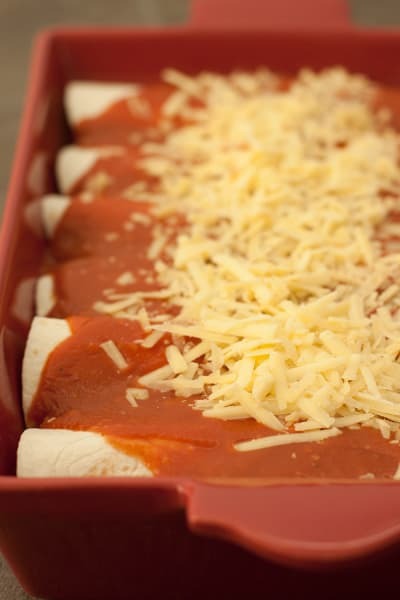 Top with additional sauce and cheese, and bake in the oven for about 45 minutes, until the cheese is bubbly. 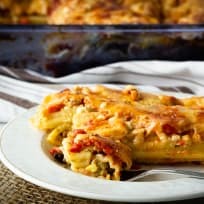 Enchiladas casserole is easy enough to put together during the shortest of naps, but if your kiddo isn't a napper (and, I can relate! ), you can also put it together after bedtime the night before. Just keep it in the fridge overnight and bake it the next day. It couldn't be simpler! For a complete meal, just add a tossed salad and some tortilla chips to scoop up all of the tasty enchilada sauce. Enchiladas are always a crowd pleaser at my house, and, the best part is, no one even needs to know they're eating leftovers. They'll be too busy asking for seconds to even notice! Combine the butter and olive oil in a saucepan over medium-low heat. Once the butter has just melted, add the garlic and cook for 2 - 3 minutes, until the garlic is fragrant. Sprinkle the flour into the pan, and whisk to form a paste. Cook the flour mixture (called a roux) for another 2 - 3 minutes, until it turns a golden brown color. Gradually add the broth to the pan, whisking continuously to incorporate the liquid and break up any lumps. Increase the heat to medium-high, and continue whisking until the mixture comes to a boil (4 - 5 minutes). You will notice that the sauce will start to thicken. 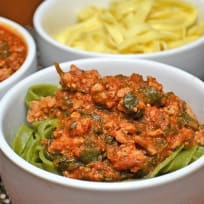 Reduce the heat to low and stir in the tomato sauce and spices. Continue to simmer for about 10 - 15 minutes, stirring occasionally. The sauce should be thick and smooth. Remove from the heat, taste, and adjust the seasonings. Season with salt and pepper to taste. 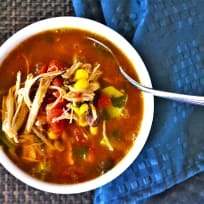 Use the sauce right away or store in an airtight container in the refrigerator for 3-4 days, or in the freezer for a few months. 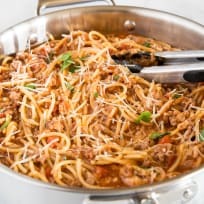 If the sauce separates (which can happen after freezing), simply heat it in the microwave and whisk well before using it. 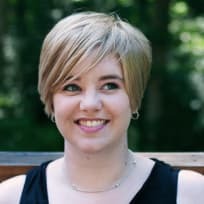 Jen's been blogging for years on My Kitchen Addiction, but it's a whole new experience with the addition of baby Maddie. If you're a New Mom in the Kitchen too, don't miss her fab recipes.